There is no small print on this page. The booking conditions and general information set out below are designed to outline our obligations to you and your commitments to us as clearly as possible. Please read them carefully before booking. We want you to have an enjoyable Wind Birds tour/trip, and the avoidance of any misunderstanding is to our mutual advantage. You should be prepared to cope with unusual situations, local inadequacies and unpredictable events as and when they occur. In individual cases some tours will demand different payment plan, this information will be passed to the client before payment. All transactions are in Euros, Portugal legal tender. All shown prices include all Portuguese taxes, Government fees, except where noted. Wind Birds, Lda operates and supplies in Madeira Islands. Therefore it pays all taxes to Madeira Regional Government. No tours/trips are exempt of VAT, although this tax value is included in the prices shown. Invoices are processed no later than five days of the service or the payment, whichever comes first. Details of lead traveller are filled as purchasing entity and cannot be changed after the invoice is issued. Therefore, if you desire an invoice with a different purchasing entity you need to request it in advance (e.g. time of booking). The above rules do not apply to Deep Sea Pelagics (e.g. Zino's Petrel Sea Expedition), in this case, all bookings are definitive, and no refunds are possible for booking cancellations, although name change of the booking holder is possible. If you wish to transfer your booking to another day, this will be treated as a cancellation and rebooking, and the relevant cancellation charges will apply. If hazard weather conditions occur, we can try to reschedule your tour to the nearest date possible, though not changing other tours previously booked to other clients. If the tour does not happen, we will refund you on 100%. In the case of this type cancellation, all deposits and other payments for the tour or tour extension will be reimbursed. We may have to cancel your tour in the event of unusual or unforeseen circumstances outside our control (i.e. casus fortuitus). For example technical problems with the boat or van, government action, war or threat of war, civil strife, terrorist activity, riot, natural or human-made disaster, disease outbreak, or severe weather conditions. If we have to cancel a tour/trip due to circumstances beyond our control, we shall refund to you. Full and transparent communication is the best way to trust in business. All tour status is broadcast via twitter.com/windbirds. As an extra, we will contact via one of the following means and in this order: short message (i.e. SMS) to the mobile phone on file or hotel reception message (i.e. fax or phone call) or by the email supplied during the booking process. We advise you that before the tour you check our status website, in the case of apparent bad weather we recommend that you call us +351 917777441 to check to status. All money can only be refunded via the same initial method of payment (e.g. paid by credit card returned to the same credit card). In circumstances that the service is paid by money, you are required to acknowledge the acceptance of the refund in writing. This rule is enforced due to the risk of money laundering schemes and online phishing techniques. Refund processing times can take up to 30 days plus the times off the settlement agents (e.g. banks, travel agents). If the services were booked directly, please contact us to check the status of the refund. Due to Government fees required for certain outdoor activities, some of these values might not be fully refundable to you, since the Government is not refunding them to us. We will provide proper documentation in these unfortunate circumstances. On a refund, initiated by a client cancellation, if there are processing fees to return the money, these will be deducted from the refund value. Any medical problems and/or related dietary restrictions must be informed to us on the reservation or prior to your tour. It is extremely important to our staff to have this knowledge in the case of any arising problems. If you desire higher coverages or different, you should contract a travel insurance. Birdwatchers often carry a lot of expensive optical and photographic equipment. Our trip insurance does not provide sufficient cover and so, if you are not already covered under your household policy, we recommend you take out specialist insurance cover for your equipment. Birds, Mammals and Flora: The species mentioned in the trip itineraries are meant as a guidance to what you might see. You should not expect to see everything mentioned, although you should see a good proportion if you participate fully in the tour and have good eyesight. We can only guarantee you that we will assist you to the best of our knowledge and capabilities. Restrictions on participants are a matter of common sense, and we have no absolute ones. If you have a health problem or any physical limitation which may hamper or restrict your full involvement in any aspect of the tour, or about which we should be aware of your safety (e.g. walking difficulties, diabetes, asthma, angina, dementia, etc. ), please advise us previously to the tour or trip. We may provide any information that you or your doctor may need to judge your capacity to participate fully in the tour. Swimming with wild animals (i.e. whales and dolphins) requires the capability to swim in the ocean without external assistance, good sea conditions and the animals cannot be stressed. Staff may at last minute cancel swimming activity for security reasons. Please note that we do not allow the collecting of plants or animals during any tour. 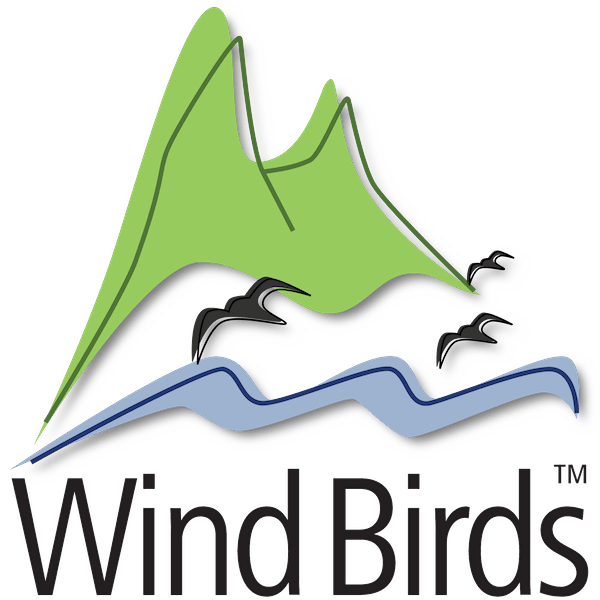 Wind Birds does not accept bookings for Unaccompanied Minors (0 to 15 years old). All minors have to be accompanied by their adult friends or family, people that the minor trusts and assumes responsibility of the minors actions. Minors that are 16 to 17 year old, parents or legal guardians can sign a waiver form taking responsibility for the minor action, though we recommend that know adults are present. Marine Lifejackets use is mandatory in Rigid Inflatable Boats, though in the swimming with dolphins trips you are allowed to remove the lifejacket before the swim. Use of seat belts in cars are mandatory by law and must be used at all times, they can only be unfasten until the car is safely parked. Opening of car doors before a complete stop is also illegal. Declining to use safety equipment or not using properly, removes us from any liability compensation in case of accident. Discharge of Pressurized Air into the Lifejackets. To offer better comfort to our client we use pressurised air lifejackets in our sea operation. The discharge of the pressurised air lifejackets in situations that are not emergencies (e.g. negligence, accidental, kids play, fun) incur in a fee of €25 per life jacket, to cover service costs. No products are allowed to be transported without written consent and in compliance with Portuguese Law. By these, we mean that all that comes to the vans and boats at start point can only leave at the finish point. (e.g. Not leaving anything in Desertas Islands, not bringing anything from Desertas Islands). In other words no smuggling. Including the substances and drinks that are forbidden under Portuguese Law, applicable even in International Waters, Alcohol and Tobacco cannot be consumed inside the vans and rigid inflatable boats. Closed-circuit television is use on particular land and sea trips. The filmed material can be utilised for law enforcement or Wind Birds video broadcasts. Video rights remain of Wind Birds. We take our business and the protection of wildlife seriously, therefore if at any point we come across industrial espionage (e.g. doing a tour to later operate against us), we will take the proper legal action and report to criminal police. In the case of present or future wildlife risk (e.g. doing a tour to obtain the location of eggs for later stealing them), again we will take the proper legal action and report to criminal police. Both acts under Portuguese law are serious crimes, and you may face imprisonment until presented in Court. There will be no refunds on these circumstances. To provide a real-time payment and booking system Wind Birds, Lda complies with PCI-SSC DSS. Therefore we do not store financial records and payment card data. All this information is transmitted between the client browser and our bank. For our record, we keep the transaction authorization hash code, amounts charged and timestamp. The stored data still allows us to recharge the client credit/debit card in the event of failure to provide payment at require times. This compliance guarantees that we are not a client financial data breach point. The website windbirds.co with a valid SSL Certificate holds legal documents for Wind Birds, Lda and guarantees secure communication between clients and us. Under Portuguese Law documents electronically signed by our management with "Cartao de Cidadão" (Portuguese Citizen iD Card) have legal value. A copy of such document is stored on windbirds.co and is accessible via QR Code imprinted on the document. Note that this documents to be valid require as well to be digital sign by an Timestamping Authority. A person that is not our staff or a client for recreation purpose, which travels on our boats and vans for an external professional reason (e.g. research funded by EU, law enforcement in mission. ), that records by any form, any information related to vessel/vehicle, geolocation, audio, video and other forms of media, as well species, technical and other data is demanded to pay two hundred and fifty euros per hour. Moreover, in slots of an hour (i.e. for a trip of 2h10 minutes shall pay 3-hour slots, that is €750). Such travels have to be authorised by Wind Birds, Lda management and fully paid 48 hours in advance. That person is required to contract an independent personal accident insurance, as Wind Birds, Lda insurances do not cover non-leisure activities. Wind Birds, Lda provides mobile alert service, these guarantees that subscribed clients receive up to date information on tour and hazard status. The service is provided to all clients that have validated their mobile phone number. Service might fail if the client has not subscribed properly to roaming mobile service with its mobile operator. During all services Wind Birds, Lda records and broadcast media. Such media appears on several social media platforms, our clients do as well share their media online, therefore there is the possibility that others outside our service recognise you. In the event of significant findings for the scientific community within our tours/trips, all short communications and scientific publications have to be approved by Wind Birds, Lda management. All information will be deemed confidential until proper publication. Freira Conservation Project manages the content of freira.org. Wind Birds, Lda supports financially for the operation of this website, Catarina Fagundes and Hugo Romano contributes with content. These three wildlife information platforms are provided free of charge to all internet users and are edited by Catarina Correia-Fagundes and Hugo Romano. Birdwatchers may contribute with reports and data. Wind Birds, Lda will watermark materials provided with the copyright owner name. The platforms try to provide accurate information, but in some cases, mistakes can occur. It all provided on "As Is Basis".